A proposito di Zorn, al sito di UbuWeb c'è un suo elenco di titoli scelti e consigliati questo mese tra i documenti audio e video dell'immenso archivio online. Blindspot is a festival of music and dance taking place at Philadelphia’s historic Christ Church and Neighborhood House from February 24, 2011 through March 6, 2011. Highlights of the festival include seven concerts by world class artists on Christ Church’s pipe organ, choreographed works by three Philadelphia-based companies, and ten all-new dance and music collaborations. 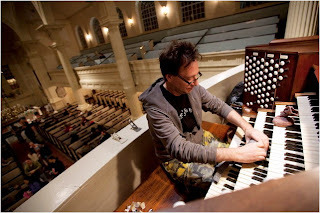 Pipe organ concerts feature MacArthur Fellow John Zorn; pioneering minimalist composer Tony Conrad; Marshall Allen and Farid Barron of the Sun Ra Arkestra; the Dufala Brothers, recent recipients of the West Prize and creators of the infamous Toilet Trike Race; Barrymore nominated composer/sound designer Troy Herion, and Christ Church’s own music director, Parker Kitterman.